Had a bit of a time attempting to spell ETITREA but it came together after I got BLOTS right. Enjoyable at any rate. Holy smoke, didn’t think Hajj would get such a response. Thank you all. I should of just looked it up. I try not to do that. If I started doing that it would become a habit for me. The point of these crosswords is too use your brain power and mess with your head. Todays theme had me stymied couldn’t get it till done, which took awhile. Still was a good puzzle. LAT 35:57 no errors. Took a while to get the theme and replace LOO with LAV. NYT #0103 from my paper today, 54:56 with 5 errors. Too many unfamiliar clues. Getting the theme helped a little but not enough. @Jack … I also had “LOO” before “LAV”, because it’s always the correct answer for that clue … well, nine times out of ten, anyway … 😜. “Kitten on the keys”? Never heard of that. LAT: 8:25, no errors. Newsday: 9:52, no errors. WSJ: 17:48, no errors. BEQ: 17:19, no errors; and (if anyone cares) I fudged my time a little: at 16:49, I thought I was done and rushed off to deal with a minor emergency; when I got back, I realized I had left one square blank and it took me about 30 seconds to fill in the correct letter. @cathy … I make a habit of looking things up after I’m done with a puzzle, the point being to learn about the things I got wrong (or got right, but didn’t really understand). 16:12. 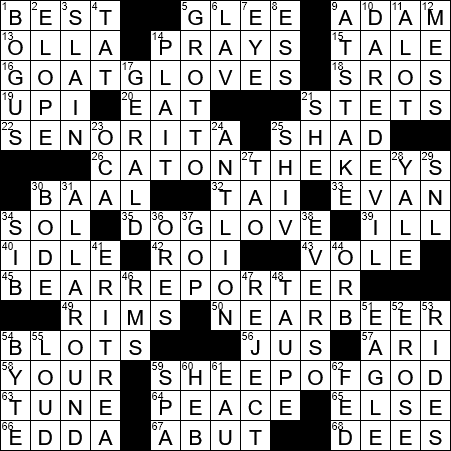 I got the theme early, but other than DOG LOVE none of the other theme answers came to me without a lot of crosses first. I had to remember EROSE from my crossword lizard brain. I think I’ve come across it once or twice. I wasn’t on the same page with this guy at all. It was killing me. Guess the rest of you did AOK. I think my stars are not lined up correctly, I seem to be having all kinds of little things go wrong already this year. Alas. Shakespeare telling it like it is for all of us and our earthly travails. No matter what, those “slings and arrows of outrageous fortune” will be our constant companions for as long as we live. Sorry for waxing philosophical today…who’d a thunk it? I’ve been using AdBlock in Safari (on my iPad) to get rid of the pesky ads here but recently other sites (like, Newsday, as of this morning) have begun to complain that they won’t let me continue unless I turn off my ad blocker. So I turn it off, per AdBlock’s instruction, but that doesn’t work by itself; I also have to go into “Settings”, find an entry for “Safari” and toggle a switch there. Anyone have a better solution? Also, @Jeff … I thought of you when I saw 1A in today’s LAT! LAT: 14:01, no errors. WSJ: 17:00, 1 crap shoot error at 43A-41D on incredibly suspicious cluing. Newsday: 15:57, 1 error. BEQ: 13:42, 2 crap shoot errors (14A-4D, 11A-13D). No excuses that crosswords can’t have clear and effective communication. I also thought of Jeff, when I came across the 1 across … Best ! All in all, a fairly tough puzzle. The long answers theme took me a lot of time to resolve, but some of the short answers were fairly easy. I remember playing with ant lions, and the word ‘erose’ is firmly in my mind, about the serrated leaves…. Not too bad for a Thursday… although I am at present grappling with a minor money problem, that I better resolve soon. All, my own fault, for being so careless. I remember ‘Agnus dei ‘ from a previous Bill’s blog… will never forget it. I also took the time today, to read all about Adam Smith … although his book was a best seller, then and now, … economists are very ambivalent about what he meant by ‘the invisible hand’. Although he believed in free capitalism … his theories ….. of not importing goods from abroad, and trickle down economics and that the government should never regulate trade … is not favored today. Economics has gone through such massive changes, that nobody, leave alone Adam Smith would have recognized it as it is practiced today … the government has a thousand laws on a multitude of monetary branches …. from securities, trade, cartels and banking, …. imports are considered beneficial, (sometimes – ) ….. foreign investment is encouraged ….. and so on…. @Cathy – I usually Google come Thursday. Today it was for GERALD – kept trying for Ford cars. Also ERITREA. @Kay – I wasn’t on Coulter’s wavelength either. Didn’t get the theme til the end, esp since I never heard of “kitten” ON THE KEYS, and I’m old. I usually miss youth subjects, for instance, EVAN and ARI, which I got by crosses. Another one that threw me for a while was RIMS, since I was thinking of round spots made by the salt. Also, didn’t know ANTLION, but that was a learning experience and I like those. What page is the Feb 7, 2019 crossword on? We have only Sections, A to D.
Never heard of an antlion and LOUD was new to me, as well as EVAN. Also had to change Loo to LAV and mAI to TAI. I now get “Speaks up?” and guessed GLEE right away. @Dave – At least in Firefox, all I have to do is refresh the page and that usually does it, and probably should for Safari as well. Thanks, Dirk. I’ll think I’ll have to start using Firefox (for some things, at least).